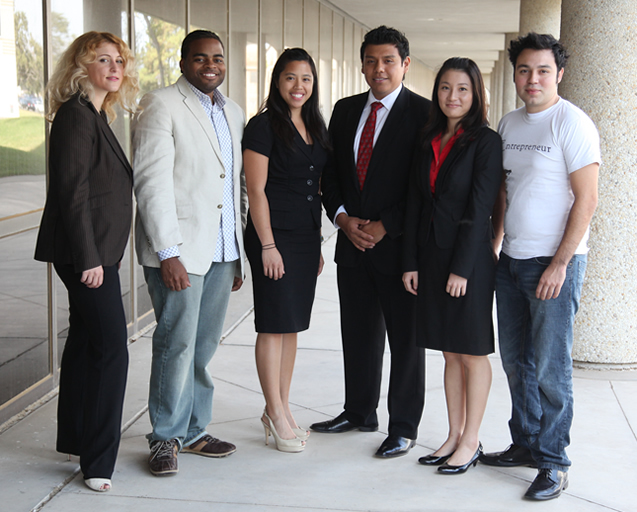 Pictured from left: Izabela Gryciuk, Jonathan Duke Nicklos, Cindy Le, Carlos V. Estrada, Eva Zhou and Robert De Los Santos. The students in the University of Houston Bauer College of Business chapter of the Collegiate Entrepreneurs’ Organization (CEO) are among the best in the nation at recruiting members from all majors to their group and applying their education outside the classroom. The student organization took home a handful of awards at the 2009 National CEO Conference in Chicago this fall, competing against 1,600 other students from universities across the United States. UH CEO won first place in the “Campus E-Diffusion” category, an award that honors chapters that expand their reach outside of the business school to recruit and involve other majors. Entrepreneurship is a growing field of study for both business and non-business college students, and UH CEO strives to promote awareness of it throughout the University of Houston campus, recruiting from the College of Technology and the Jack J. Valenti School of Communication. CEO corporate relations officer Izabela Gryciuk says Bauer College aids in their efforts by allowing non-business students to pursue a Corporate Entrepreneurship Certificate through the Cyvia and Melvyn Wolff Center for Entrepreneurship. Gryciuk also received an individual award for Best CEO Student Leader in the country. The award, given to the CEO officer who best enhances the experience of their members, highlighted Gryciuk’s outreach in the Houston business community. In 2009, she helped organize trips to the Southwest Shipyard and Schlumberger’s Sugar Land drilling site and leveraged valuable partnerships with the Entrepreneurs Organization, Houston Strategic Forum, The Indus Entrepreneurs (TiE) Houston and the University of Houston Small Business Development Center. Several members of UH CEO have taken those opportunities and built thriving businesses, exemplifying young entrepreneurial success. The organization’s president, Robert De Los Santos, has been featured in Entrepreneur magazine and was selected as a finalist in the Global Student Entrepreneur Awards. His company, Sky High Party Rentals, provides party rental services that include everything from moonwalks to inflatable drive-in movie screens. Another UH CEO member, Jonathan “Duke” Nicklos, has also applied his entrepreneurial skills in the real world. At the conference, he was a finalist in the elevator pitch competition for an initiative he created called “It ends with me,” a network that provides 24-hour support to help people break the cycle of addiction. Gryciuk says the organization has inspired students across the spectrum — including technology, social sciences and the arts, among others — to take what is taught in any discipline and turn it into a profitable business.